This week’s Yarn Along (via Small Things) looks very like last week’s. The cardigan has come on – a bit – though it doesn’t much look like it. I’ve completed the yoke, so now I’m slogging my way down the body in small snatched of time (usually after meals, waiting for the children to finish.) It’s great fun to wallow in my own yarn though – something I haven’t really had chance to do for a little while. 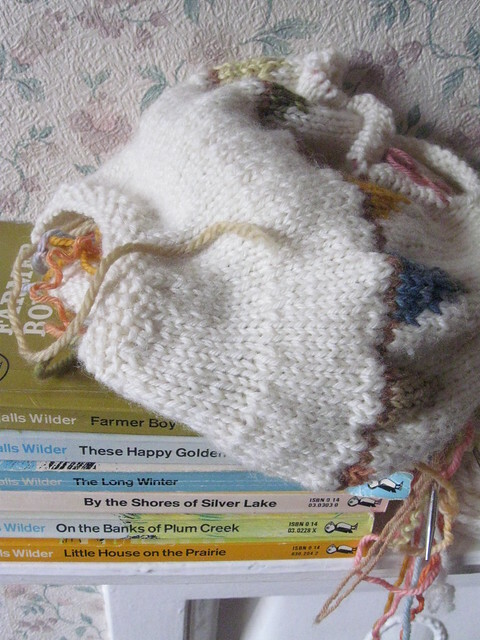 Book-wise, I have managed to get hold of a large chunk of the Little House on the Prairie series through our local charity shops. They are 60’s-70’s Puffin editions, and all (except The Long Winter) are in very good condition. I grew up with this era of paperbacks (though I’m only 33!) so they fit right into our bookshelves and already feel very familiar. I’ve never actually read the series before, but I started Little House on the Prairie while waiting for the washing to dry at the weekend and really enjoyed it. I’m finding the parenting is a great excuse to finally read/re-read all those classic children’s books that have been on my list for years. W read original version of The Wind in Willows at the end of the last year and had a great time. I bought my sister Swallows and Amazons (to go with her theatre tickets to see the musical), at christmas, and got myself a copy while I was at it. And after crying at the end of a very, very heavily abridged version of The Railway Children (father steps off the train and I’m a puddle of tears!) I’ve promised myself some time with the original novel at some point this year. Excitingly, you can get a load of these classic texts for free via Project Gutenberg, which works well if you have some sort of digital reader. Mind you I’m a sucker for a second-hand edition from amazon or charity shops. Oooh, you’re missing LIttle House in the Big Woods! That’s actually the first one. I have just borrowed it from the library! I’m half reading it to FB though I think he’s a little little still. Totally agree about re reading. Some books survive the years, others are so different from the ones I remember. I can’t resist popping into charity shops to check out their paperbacks. how pretty that white wool is, i really like it. and i love all the books you’ve mentioned. oh the railway children! my own children (and i ) loved that series.